We love these wacky kitchen products from This Old House! Which one do you think is the craziest? "Sure you could use a run-of-the-mill pizza cutter, but you could also hire someone to custom cut your crown molding, and really what's the fun in that? Get perfectly straight edges with the Pizza Boss 3000. 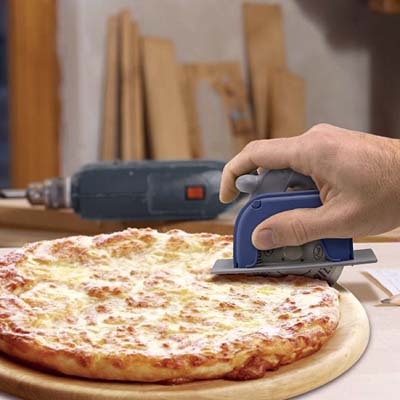 This mini table saw has a stainless steel blade that is sure to cut through the deepest of deep-dish pizzas and sports a removable shield for easy clean-up. Show your pizza who's DIY boss." "Got a 5:30 black tie dinner you just have to go to? Take these sophisticated napkins along in your toolbox and voila, your flannel Carhartt work shirt is transformed into something even Brooks Brothers would be proud of. The perfect accessory for the discerning DIY-er." "Ever sat down to dinner only to obsess over whether you got the dimensions right on the deck to be installed out back tomorrow? Have no fear, dedicated DIYers. 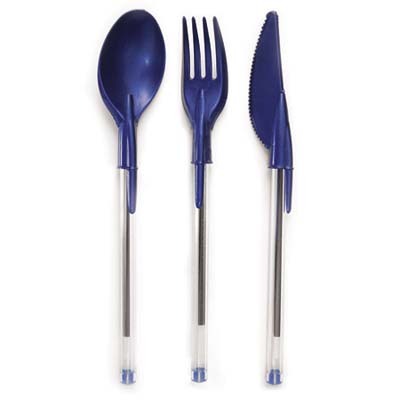 These utensils attach to a standard Bic pen, allowing you to work and eat at the same time. 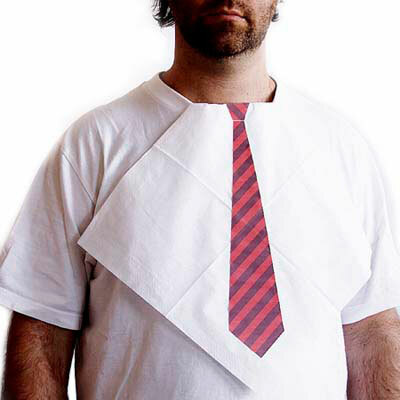 Throw on the Dress for Dinner napkins and you can eat in style right at the job site." "Live in a small space but love to have blowout parties? 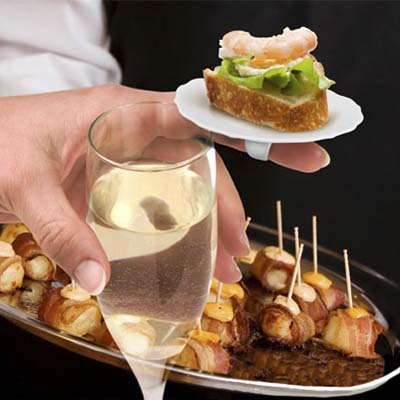 If your guests are elbow to elbow try freeing up space by giving them these classy mini-plate rings that allow them to hold both their champagne and their pigs in a blanket at the same time." "If your college-age kid is always hitting you up for more grocery money because he claims his roommate steals all his food, this idea could potentially put an end to all his financial excuses. 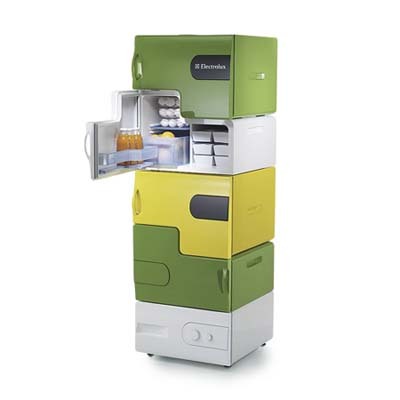 Flatshare, a concept modular fridge and winner of the Electrolux 2008 Design Lab Contest, has up to four separate compartments, one for each person residing in an apartment or house. After the lease is up, each compartment, which can be customized with different colors, can, theoretically, be transported to a person's new residence. " Love the the humor with these innovative products! I like the necktie table napkin!